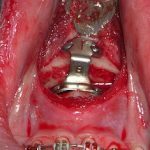 Background: When most people envision the type of patient who presents for aesthetic lower jaw augmentation, they would assume that the person has a noticeable short lower jaw…in essence a true jaw deficiency. While this is historically true and is still an accurate perception for some patients today, an increasing number of patients now present for what I would call ‘enhancements’. A facial enhancement is a generic term that indicates the needed aesthetic change is more subtle. This indicates that the original aesthetic ‘deformity’ is more modest in size and a major improvement or change is not needed. Some visible improvement is needed to a facial structure that is average in size and proportion. The patient seeks to have improvements in its structure which frequently means as shape change that gives it a specific definition. 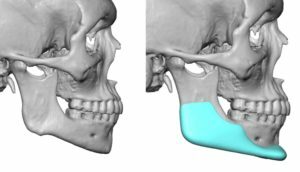 Thus enhancements of the average sided lower jaw usually means two specific type of improvement. 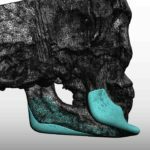 First patients always want the three corners of the jaw to be more visible, the shape of the chin and jaw angles are more evident. Secondly, the connection between the three corners is frequently requested to be more smooth and visible, a linear jawline look. Only a custom jawline implant can possibly achieved all of these concurrent improvements in a single design. Case Study: This young male presented for a ‘jawline enhancement’. He did not have a particularly weak chin or overall jaw deficiency. He just had an average jaw shave of which he wanted it improved or more than just ordinary. In looking at his jawline it could be seen that there was some asymmetry and the jawline from front to back had the classic antegonial notch shape in front of the jaw angles. 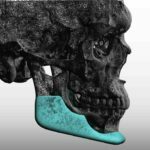 A custom jawline implant design was done that made a smooth connection between the chin and jaw angles as well as provide some further chin projection and jaw angle width. Under general anesthesia the implant placement was done through a combined submental skin incision and bilateral intraoral posterior vestibular incisions. The modest implant dimensions permitted it to be placed as a single piece in a front to back insertion technique. Screw fixation was done at the three corners. The custom implant for jawline enhancement has become increasingly popular for its ability to create definition and shape over just size. 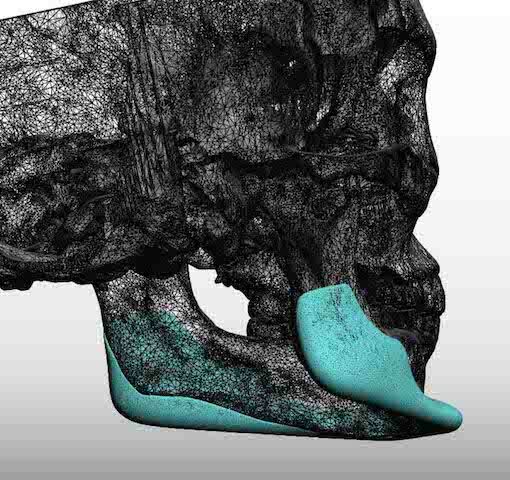 Its connected design that wraps around the entire jawline provides a linear look between the increased projections of the chin and jaw angles. 1) A custom jawline implant provides concurrent and connected ‘three corner’ lower jaw augmentation. 2) A custom jawline implant can also create a linear jawline look in those jawlines that have a naturally non-linear shape. 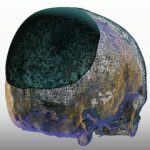 3) For some jawlines in thinner patients who do not necessarily have a weak jaw, the custom implant design or more about creating vision corners that have a smooth connection.